Not far away from the Brezice Castle, near the largest Slovenian natural spas and the second largest Slovenian tourist center Terme Catez, pearly confluence of the rivers Krka and Sava, there is the Youth Centre Brezice where we provide accommodation, relaxation, socializing and many experiences of your choice. It is suitable for members of all generations from the youngest to those of mature years. We offer accommodation in suites, dorms and twin rooms, furnished in a fresh style with clean lines and colors, and decorated with playful animal silhouettes. A total of 17 rooms are available: three double suites, four six-bed dorms and ten twin rooms. At the reception there is a tourist information point, which provides all information on local sights as well as a rich collection of tourist brochures on the sights of Slovenia. Guests can use the common kitchen with all the additional equipment where they can prepare their own delicious and fresh meals all by themselves. What is more, the kitchen has a common room equipped with a TV and a DVD player. On the second floor the guests can relax on the sunny terrace with chairs and tables perfect for socializing with a view of the Castle and the city park. The hostel has its own laundry room which is offered as one of the extra-charge services, with two washing machines and two dryers. With all additional beds we can accommodate up to 71 people at once. There is a small desk and a chair per person in every room as well as wireless internet, which enables the perfect work conditions. 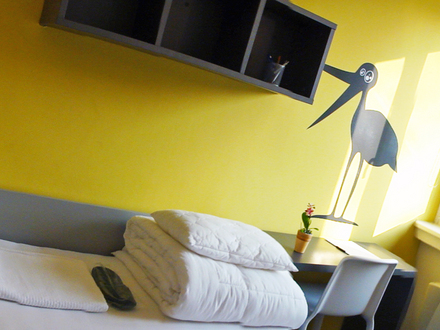 During your stay in Mc Hostel Brežice we offer you use of additional facilities. Youth center Brežice with MC hostel boasts with an excellent technical and other equipment of our facilities, which can be rented by prior agreement. WiFi Internet access is possible on the entire premises.